Check into your hotel in downtown Montreal and enjoy a relaxing day exploring the city. You might want to take a peaceful stroll at one of the world’s best botanical gardens. The Montreal Botanical Garden showcases over 22,000 plant species and cultivars, as well as a planetarium, biodome, an insectarium, themed greenhouses and gardens, including the popular Chinese Garden. 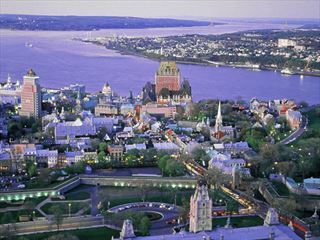 Before leaving for Quebec City, get a different perspective of The City of Saints by taking a cruise along the St. Lawrence River where you’ll see sights like the Old Port. Ste-Helen’s Island and the Boucherville Islands. Get to know this French-speaking city on a cruise. 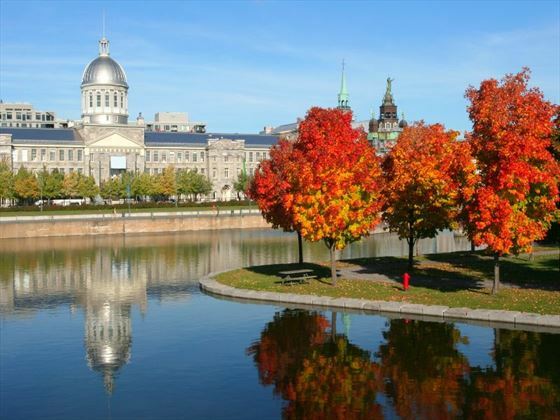 Accompanied by a guide, discover the many facets of Montreal on the St. Lawrence River. Explore 25 km of history, attraction and unspoilt landscapes. Wake up the following morning in North America’s only walled city and enjoy a full day of exploration. Stroll the cobblestone walkways in Old Town, gazing up at the well-preserved 17th-century architecture, stopping at the Citadel where you might see Canadian troops staging a military ceremony. 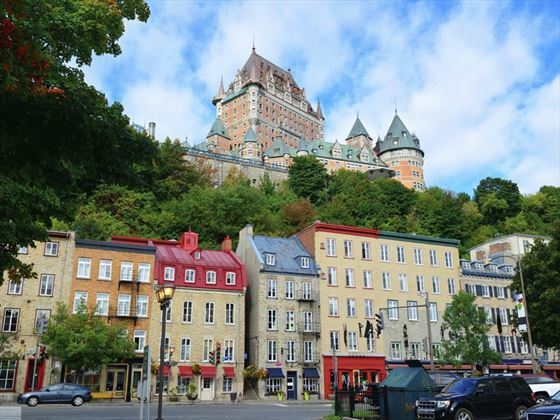 Other must-visits include the Plains of Abraham, the National Assembly and Parliament Buildings, the Notre Dame Basilica, and the Upper and Lower towns. In between, do like the locals do and snack on poutine, French fries with gravy and cheese curds. Follow the south shore along the St. Lawrence River to Rivière-du-Loup. Before checking into your hotel you may want to stop for a picnic along the coast. From the Park of the Luminous Cross, enjoy the expansive view of the town centre, the St. Lawrence and the Les Pelerins Islands. Afterward, take time to view the historic homes and buildings in Rivière-du-Loup, like St Patrick’s Church and City Hall. Today you’ll travel to the Gaspe Peninsula and Baie des Chaleurs, with the stunning marine seascape highlighted by a gorgeous mountain backdrop. Make your way to the top of Mont Saint-Joseph, on foot or by car, to admire the panorama of the sea and the mountains from the over 1,820-foot-high summit, and visit the Oratoire Notre-Dame, a Brittany chapel famous for its stained-glass windows and mosaics. Journey to the tip of the peninsula, passing Port-Daniel, a community of Scottish, Acadian and Irish descent. By taking the Capitaine Fournier Road, you’ll get an excellent view of the railway tunnel that crosses Cap de l’Enfer, “Cape of Hell.,” the only one of its kind in the entire province. From the Surprise Coast Highway, ‘Côte de Surprise,’ near the small fishing port of L’Anse-à-Beaufils, you can soak up a full view of Percé Bay and Quebec’s most popular attraction, Percé Rock, which rises dramatically from the Gulf waters. In the morning, explore the charming village of Percé, which was once the largest fishing port on the peninsula. Take a walk along the boardwalk that stretches along south beach, and then enjoy the bustle of activities in the village, lined with a wealth of restaurants and cafes, art studies and boutiques with colourful facades. 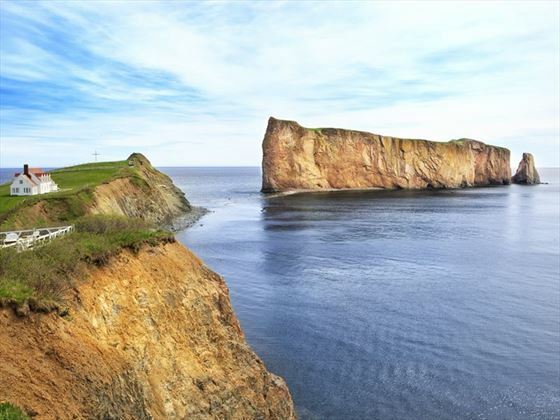 Visit the geopark to admire the view of Perce from a glass platform that’s suspended 660 feet above ground. Afterward, join a discovery cruise to view Perce Rock up close, and the seabird sanctuary on Bonaventura Island, the most accessible northern gannet colony on the planet. Along the way, keep an eye out for the whales that can often be seen along the Gaspesie coast. Today’s adventure will take you to the heart of the Gaspe Peninsula, with a stop at Forillon National Park with its rugged cliffs, pebble beaches and tranquil coves home to the area’s most prominent landmark, the lighthouse at Pointe-au-Pere National Historic Site. See the wild rose bushes in Cap-des-Rosiers, and stop for a lovely photo-op at Gros Morne. Your destination is Sainte-Anne-des-Monts, the gateway to Parc de la Gaspesie. Enjoy a full day at Parc de la Gaspesie, home to 25 mountains that are more than 3,300 feet high, and an abundance of wildlife, including a large moose population, caribou, wild-tailed deer and hundreds of bird species. Get out on the nearly 87 miles of hiking trails, take a guided nature tour, or paddle across the water in a canoe. Be sure to check out the exhibit at the Interpretation Centre, which is also a great place to pick up a souvenir and learn more about the park’s flora and fauna as well as its geological history. 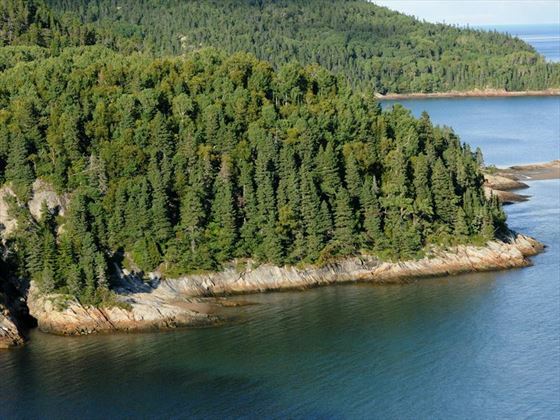 Say goodbye to the Gaspe Region and hello to Tadoussac, a destination that’s highly popular with marine life enthusiasts, particularly whales. Located where the Saguenay and Saint Lawrence rivers meet, this is the spot where multiple species of whales congregate, including minkes and begluas. Before reaching Tadousac, art lovers should stop in some of the small towns which host art galleries that showcase some of the region’s finest works of art, including its renowned wood carvings. As you cross the St. Lawrence via ferry, be sure to watch for the whales that are frequently spotted along the way. On your way to Lac St. Jean, spend time exploring Saguenay Provincial Park, which protects land along the north and south shores of the 65-mile-long Saguenay Fjord. Witness the movement of icebergs that moulded these jaw-dropping landscapes and the fjord, and then learn more about its formation at the park’s interpretive centre. Choose your favourite way to continue explorations in the awe-inspiring Sagueney Region by hiking, horseback riding or boating around the uniquely circular Lac St. Jean. Cap off your day by driving through some of the province’s most wild terrain, overnighting in Saint Felicien. Your final two nights of the adventure will be spent in Saint-Alexis-des-Monts, with overnights at Lac à l'Eau Claire, where you’ll have access to a wide range of complementary activities like sailing and windsurfing on the picturesque lake, or just relaxing on the beach and enjoying the view. You can also choose to paddle the river in a canoe, take an ATV tour, golf or even an unforgettable seaplane flight. Today your self-drive holiday in Quebec comes to an end, you’ll head back to Montreal Trudeau International Airport to check in for your return flight. 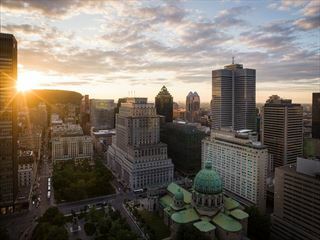 At the centre of Montréal’s vibrant cultural and commercial district sits the city’s grandest and most gracious hotel - Fairmont The Queen Elizabeth. Fully refurbished in 2017, this hotel offers wonderful eating and drinking opportunities in a great location. 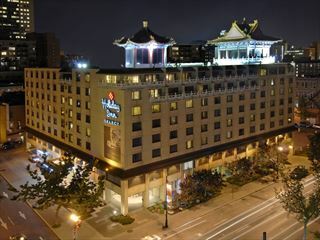 Located in the heart of downtown Montreal is the Holiday Inn Montreal Centreville Downtown. This unique downtown Montreal hotel offers warm hospitality, and exceptional services.